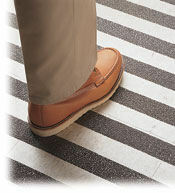 3M Safety Walk Tape General Purpose Tread #610 Black 3/4" x 60 ft.
Mineral-coated, slip-resistant surface. Low profile design reduces trip hazard. For use on smooth, flat surfaces. Pressure sensitive adhesive, covered by a removable protective liner is easy to apply. Applications: stairs, ramps, entrances, lawn equipment, ladders, snowmobiles, scooters, construction machinery and vehicles.